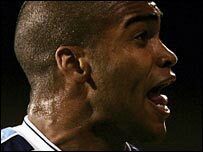 Plymouth have signed striker Jermaine Easter on loan from League Two Wycombe with a view to a permanent move. The 25-year-old Wales international had been the subject of two bids by the Pilgrims earlier in the season. Argyle manager Ian Holloway said: "He scored 17 goals last year, in a lower division, but we believe he will score goals at whichever level he plays. "Hopefully, he can do it very quickly here. He will throw something different into the mix for us."